This quiche is a classic example of how my seemingly innocuous cooking hobby manages to inconvenience and irritate people. My girlfriend Kim and I were planning to do a simple Friday night dinner date at my apartment, and she requested something with goat cheese. 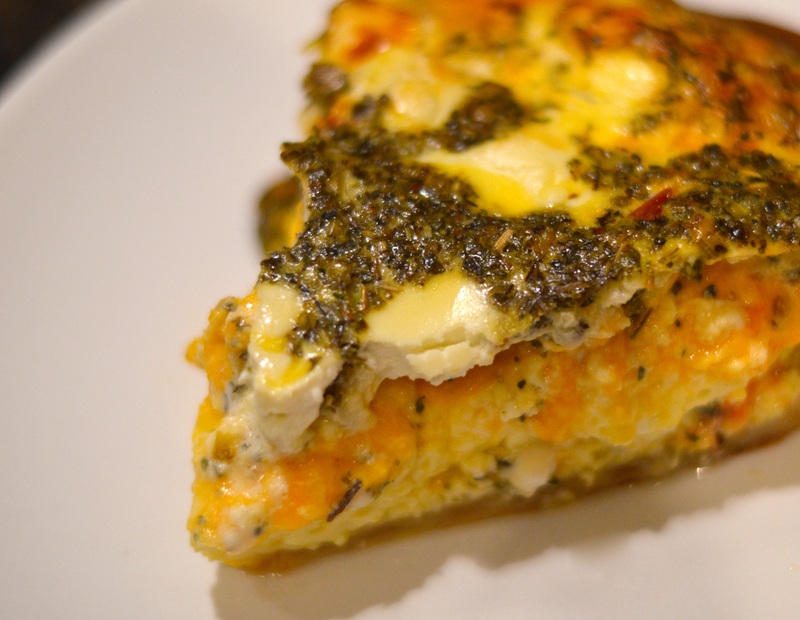 Specifically, she wanted a frittata that I have made previously for the blog, but I didn’t want to do a repeat recipe, so I settled on a quiche. They’re pretty similar. Kim couldn’t come over until about 8:00 p.m., so I went and grabbed beers with a friend before heading to the grocery store and meeting her at my place. As a result, I didn’t even start this meal until sometime after eight. Of course, I neglected to factor in that I would need to par-bake my crust. Then, I overdid it on the filling, adding a bunch of cheese and herbs at the last minute. This made the unbaked quiche terrifying to move (I spilled some), and it took a lot longer than usual to bake. All of these minor mistakes and inconveniences added up to an 11:00 p.m. dinner time. Good thing we made a salad around ten. Despite my poor planning, the quiche itself was excellent. It was particularly good for breakfast this morning. It has fed me for two meals and Kim for one so far, and I have two thirds of the thing left over. I’d highly recommend throwing a bunch of your favorite summer vegetables into a quiche soon, and hopefully you plan better than I did. Heat oven to 325 degrees. Mix the onion, eggs, cheddar and herbs in a large bowl. Whisk vigorously to break up the egg yolks and be sure that everything is well incorporated. Pour mixture into pie crust. Drop in tomatoes so that they are evenly spaced about a half inch apart, so that they are spread throughout the quiche filling. Pinch off small pieces of goat cheese and distribute them in the same manner as the tomatoes. 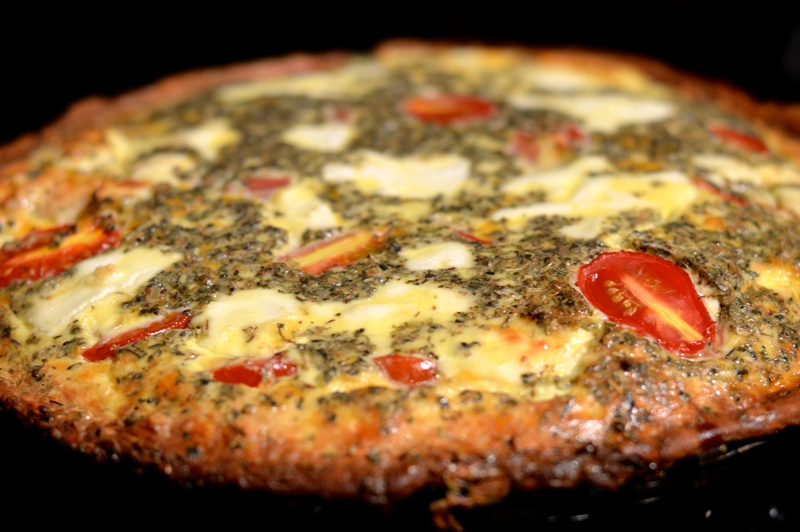 Place quiche in oven and bake for 40 minutes, though it may take longer depending on your oven. It will be finished when the center of the quiche has a slight jiggle when you give it a gentle shake. Remove from oven and let cool until it is just warm or room temperature. *I used Publix premade crust dough from the refrigerated section near the biscuits. To par-bake that kind of crust, oil a pie plate and roll the pie dough over it while the oven heats to 450 degrees. Cut the excess dough from the edge of the pie plate and press the dough against the sides of the dish. Prick the dough across the bottom with a fork, then spread aluminum foil over the dough and weight it down with beans, rice or pie weights. Bake for 15 minutes or so, then remove the foil and weights. Bake for another 10 minutes or so until nicely browned. The packaging for this kind of dough will also include instructions.